Are two small cars better than a mini van? With dual-income families on the rise, it is not uncommon for families, especially those with younger children, to have a mini van and a second vehicle for one of the working spouses. But is having a mini van truly necessary? Perhaps it would be more economical (and better for the environment) to have two small cars, and for special events or trips, when a larger vehicle is necessary, rent a mini van for the day or weekend. One Ottawa blogger ponders the question: Are two small cars better than a van and a compact? In an interview last week with Automotive News Europe, Fiat CEO Sergio Marchionne mentioned that the company is hoping to sell its first microcar by 2009. It's a "true beauty," said Marchionne. 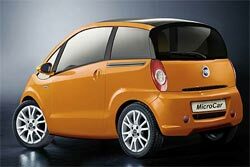 We can speculate that it might look quite a bit like the concept microcar that Fiat presented to the world in 2005, pictured here. Perhaps they can call it the "Piccolo" (italian for small), but more likely it will end up being a variation on the Panda, their current (slightly ugly) almost-micro car. Fiat has been having great success with its updated version of the Fiat 500, the Fiat Nuova 500; it's selling very briskly in Europe and is garnering many awards, including the prestigious EuroCarBody 2007 and the European Car of the Year 2008. It would appear that this success is giving Fiat confidence to go even smaller... Roughly 30 centimeters smaller to be precise (to get into the microcar category). Following up on my last post, although I wasn't able to find the data for small cars specifically (for now, it seems that all sales data that is publicly reported in Canada lumps all car sizes into one "passenger cars" category; this needs to change! ), there do seem to be some noticeable divergence in car sales vs. truck/SUV sales in Canada. In the last Statistics Canada New Motor Vehicle Sales report published November 15th, we find that 4% less passenger cars sold in September 2007 than a year before. In the same period, trucks and sport utility vehicle sales declined 5.2%. Canadians were buying less new vehicles, but the slowdown was more acute for bigger vehicles. This is consistent with the anecdotal reports I've heard of increasing sales of small and economy cars; my suspicion is that the passenger car data is being buoyed by this segment. But that's just the start. One could then argue that the environmental footprint of the C1 is smaller than the hybrid Prius simply because it can be manufactured with less stuff; it is lighter, its engine is simpler, it is easier to recycle. Not to mention that its smaller physical size is good in other ways; it doesn't require as wide a road to operate, needs smaller parking spaces, etc. -- so it doesn't comtribute to the general encroachment of paved space into the world's green spaces. I don't buy the way hybrids are presented as the responsible, green choice. It's good marketing for sure, but the truly environmentally responsible choice is to go small! Looks like Chrysler is smartening up. They have decided to go after the small car market after all. Albeit by partnering with a Chinese company who only pays its employees up to a whole $2 (USD) a day; looks like building a higher fuel efficiency compact automobile is not the only "efficiency" they have in mind. And, yes, Chery is the same company GM complained, not so long ago, that it had a deceptively confusing, trademark-infringing, name. Potential entrepreneurs take note, choosing a deceptively similar product or company name could eventually land you a large deal, or a partnership... with the the copyee's competitor. PRESS RELEASE: Auburn Hills, Mich./Stuttgart, Germany, Feb 27, 2007 - The DaimlerChrysler Supervisory Board today approved the framework of a limited partnership to develop small vehicles between the Chrysler Group and Chery Motor Company of China. The deal is still contingent upon approval by the Chinese government, but the final pact of the framework is expected to be signed by the end of March. Under the non-equity partnership, Chery-built vehicles will be distributed under Chrysler brands, primarily in North America and Western Europe. Chrysler Group indicated that the partnership would allow the company to become a bigger player on the global automotive stage by giving it access to products in new segments more quickly, with less capital spending. Small vehicles such as these will allow Chrysler Group brands to compete in segments in which the brands do not currently compete, and which are especially important in price- and fuel-economy sensitive markets. Some 67 percent of all vehicles sold outside of North America are in these segments. Chrysler Group’s major competitors in the U.S. and Western Europe have similar arrangements with Asian manufacturers for vehicles in these segments. Chrysler: The canary in the "big car" coal mine? This week DaimlerChrysler announced some pretty significant job cuts. The affected plants are located in Michigan, Ohio, Indiana, and Ontario -- speficially, those involved in the production of sport utility vehicles, pickup trucks, and other large vehicles. These types of vehicles, we're told by DaimlerChrysler, are just not selling as well as they used to. This is certainly not just a Chrysler-specific phenomenon. Rather, it is early evidence of the eventual move towards smaller vehicles in North America. Although the general public is not clamoring for small cars quite yet, there is an unmistakable trend towards higher fuel efficiency. This the first step. Unfortunaely for Chrysler, they are not very well positioned for the "small" future -- their smallest vehicle available is the PT Cruiser -- perhaps destining them to be just a small player in the auto field. There is currently a lot of buzz around about Daimler spinning off Chrysler, and business news headlines are filled with talk of potential buyouts or mergers (particular with GM). If I were a potential suitor looking at Chrysler, I would only value it as a future niche player; they are pretty good at making "pimp-mobiles" after all, such as the Chrysler 300 that's still a hot item in the hip-hop world.